Portland’s cargo bike scene is exploding with businesses, builders and enthusiasts coming together for networking, collaborations and more. 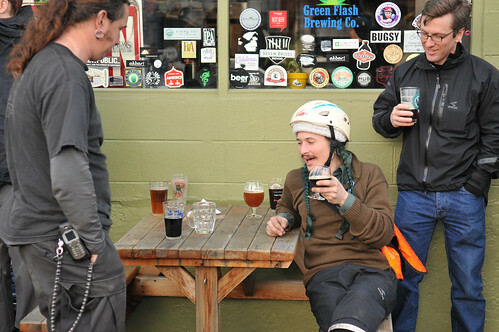 This photo (and more below) was taken at a meet-up of cargo bike fans back in April and there’s another “Cargo Bike Roll Call” happening tomorrow night in Southeast Portland (5-8pm Cascade Barrel House, 939 SE Belmont). Much has been written about Portland’s impressive crop of custom bike builders; but there’s a new niche in our local scene that is also showing impressive signs of growth and maturation. I’m talking about cargo bikes and the men and women that build them, sell them, make parts for them, and run businesses with them. What began with the first retail store in America to sell Dutch “bakfiets” cargo bikes (Clever Cycles) back in June 2007 has matured into a multi-layered industry sector where exciting collaborations are taking place and a redefinition of what a cargo bike can be is underway. 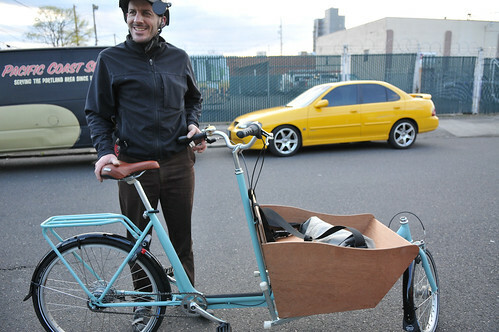 Suffice it to say, Portland’s cargo bike scene is exploding. 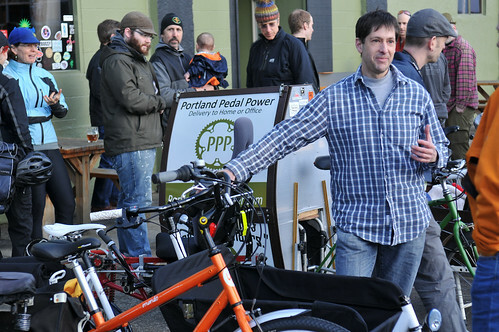 Back in April many of Portland’s cargo bike enthusiasts and business owners got together for a meet-up at a pub in Southeast Portland. 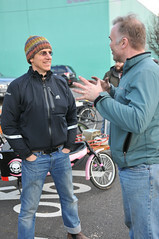 The gathering was organized by Spendid Cycles owner Joel Grover in response to a visit by a reporter from Bicycling Magazine who was coming to Portland to do an article on cargo bikes. Grover himself is a prime example of how Portland has embraced cargo bikes. 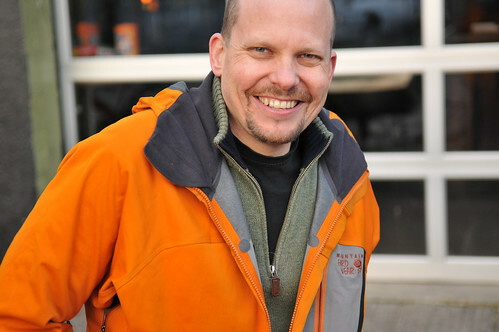 After 20 years in the bike industry, many of them as head buyer for Bike Gallery, Grover launched his store in May 2010 to focus solely on cargo bikes. Now integrating electric-assist on many of his builds (check out his latest, a Bullitt with Bionx and a Surly trailer), Grover is carving out a successful niche. Wakefield Gregg owns The e-Bike Store on N. Alberta and Vancouver. He reminds me a bit of Christopher Lloyd’s “Doc” character in Back to the Future. Wake is way ahead of everyone else and is always tinkering with a new product, modification to an existing one, or some other invention. 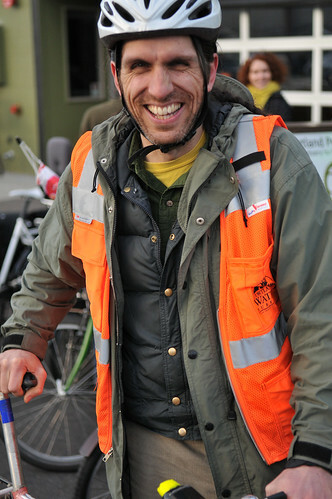 An expert in e-bike technology, he contracts with Clever Cycles to install e-assist kits and he helped Yuba bicycles develop their new e-assist Mundo cargo bike (the cleverly named “El Mundo”). This is Tad Beckwith, VP of marketing and sales for EcoSpeed, a Portland-based company that claims to have the “Best Electric Assist on Earth.” Tad’s system is getting rave reviews and can be seen on a growing number of local bikes. A closer look at an EcoSpeed kit as installed on a Larry vs. Harry Bullitt. Tom LaBonty has a day job; but he’s gained a large following with his affordable and whimsical DIY cargo bike creations he sells via TomsCargoBikes.com. One of his recent builds, for Hotel Monaco, includes an integrated coffee pot and beer tap on the rear rack and a five gallon keg for the beer system in the cargo bin. Tom’s bikes range from $500 – $1,400. Another guy who’s familiar with beer bikes is Phillip Ross of Metrofiets. 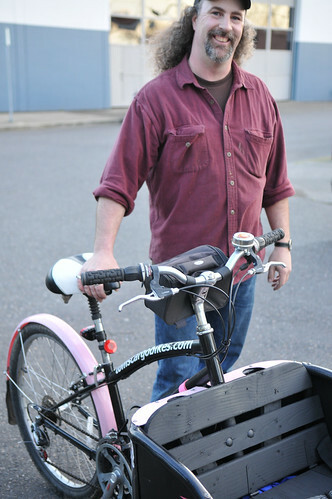 His company (which he runs with builder Jamie Nichols) has built a reputation for their finely crafted cargo bikes that have been used by many different businesses — from a cafe in San Francisco to a local brewer. 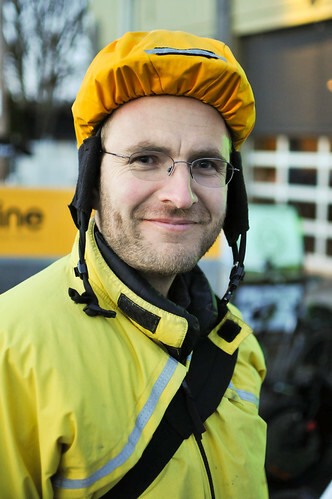 Reuben Deumling is carfree and a passionate advocate for utilitarian, load-carrying bicycles. He built this trailer out of a truck’s roof rack with parts from a Bikes at Work trailer. Adam Kennedy owns Broken Frame Bakery. He uses his custom Metrofiets (dubbed the “Breadnaught“) to make his early morning deliveries. One of the things that makes Portland’s cargo bike scene tick are the smart and passionate people who dream up better ways to carry things. One of those people is Aaron Tarfman. 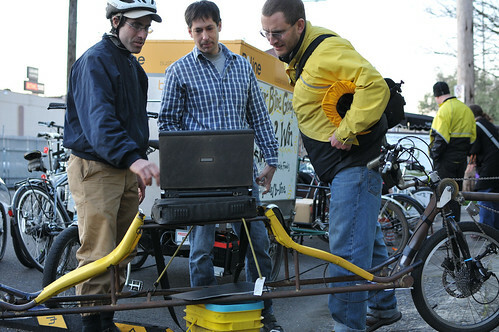 In this photo (on the left), he’s showing Joe Doebele (owner of Joe Bike) and Tad Beckwith one of his latest concepts. This is Ken Weatherell, founder and owner of Portland Pedal Power, a company that contracts with dozens of local restaurants to deliver meals and then sells the sides of their delivery bikes as advertising billboards (see one in action here). Mike Cobb is something of a bicycling renaissance man. 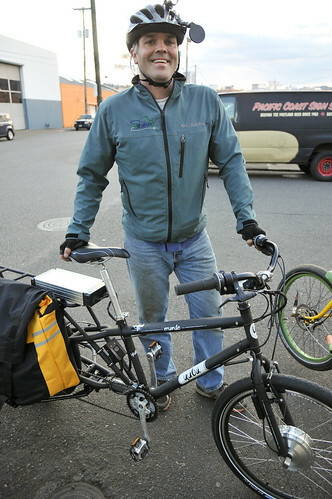 A skilled messenger who has competed internationally, he is currently the service manager at Joe Bike, a cargo bike specialty retailer based in Southeast Portland. 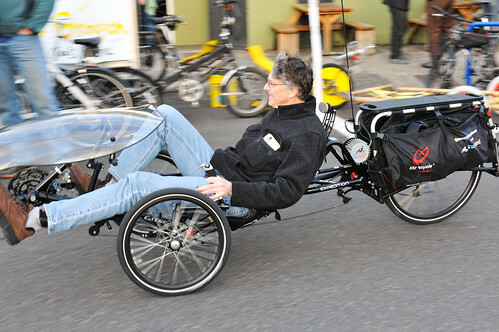 Cobb is riding a Joe Bike “BoxBike”, which comes with several locally-made parts. What makes any community powerful are the connections made by the people in it. The cargo bike community is no different. In this photo, Metrofiets builder Jamie Nichols (seated) chats with Cafe Velo owner Rick Wilson (R) and cargo bike messenger Joel Metz. 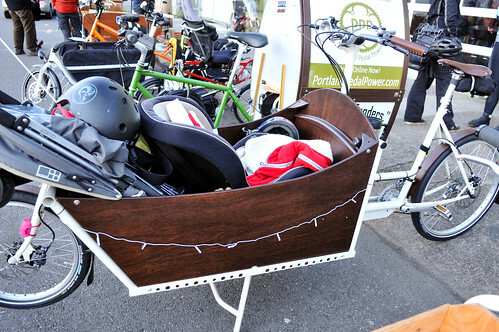 For more photos of the April cargo bike meet-up, see the gallery. 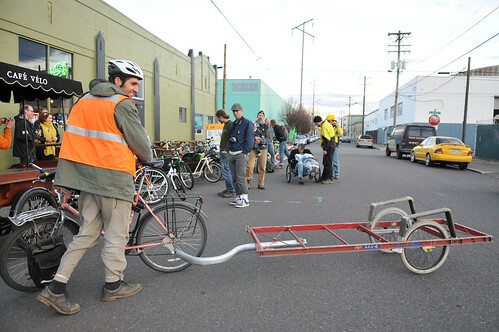 This post highlights just a small part of Portland cargo bike scene. As the companies, ideas, and relationships continue to grow, I think we’ll be hearing a lot more from them in the months and years to come. I could be mistaken, and i’m sure someone will tell me so, but I think the bike shown with Mike Cobb is not the Shuttlebug but a modified import which Joe also sells. Picky, picky, picky. Thanks for catching that JR. It is indeed a boxbike. Edits made. Thanks for the correction, JR and Jonathan, and for covering the cargobike scene so well and so often. JR should know about the ShuttleBug, as he’s crafted some beautiful parts for it. I’d like to clarify something that’s confused and misled people about my business and about Joe Bike’s standard boxbike (not the handmade ShuttleBug) here in the pages of Bikeportlandville, where the words “China” and “Chinese” are almost always mentioned in the same breath as my shop (check it out). Over 90% of bikes sold in the US are made and assembled in China. The standard boxbike frame is made in China. 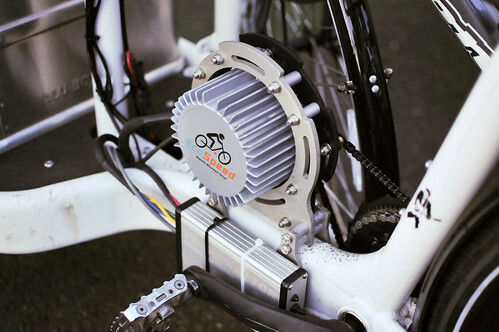 It’s powdercoated in Portland and 100% assembled in Portland, and includes a Portland-made box, wheels we build ourselves, and high-end (for this application) components. Even things like the safety harnesses are made here. 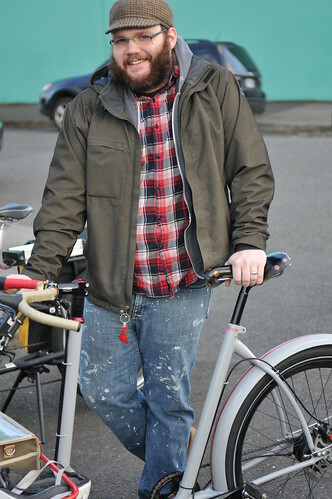 Close to a dozen independent Portland designers, craftspeople and artisans contribute to each bike. In other words, the boxbike has more local input than any other cargo bike on the market except for those whose frames are made here in Portland–which means (at least for now), Metrofiets and our own ShuttleBug. 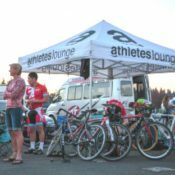 Bikeportland never mentions the Chinese or other origins of bikes sold by other shops under American or European labels. Making an exception for Joe Bike paints a picture of my business that is exactly the opposite of reality. I’ve mentioned this in emails to you, Jonathan, in the past and described some of the damage done. I’m not necessarily opposed to Chinese exports (my mother’s one of them), but it’s a fact that of the 68 or so bike shops in Portland, Joe Bike is one of the two that have the lowest Chinese content and the highest local content. The boxbike is just a case in point. Overall, no more than 20% of our bikes are made in China (compared with over 90% of bikes sold in the US), and fewer than half of the bikes we sell are cargo bikes–most are fairly high-end belt-drive city bikes. In the past year we’ve made and sold about as many locally made ShuttleBugs as boxbikes. Please get to know our lineup before describing the shop in the future. Thanks. See you this evening at Cascade! JR, I wasn’t referring to your comment, but to Jonathan Maus’s religious habit of applying the words “China” and “Chinese” whenever he mentions Joe Bike, as he did once again in his post yesterday. (I’m not suggesting anyone has a derogatory intent.) About 10 minutes ago, a visitor from California was in the shop to talk with two employees and me about cargo bikes. We talked about the Mundo, the Civia Halsted, and other utility bikes that are made in China. Country of origin never came up. 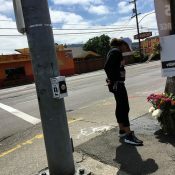 Then he saw the boxbike and said, “Is that the one that’s made in China?” I attribute this misunderstanding pretty much 100% to Bikeportland’s coverage, which is laden with errors in both connotation and denotation. That’s all. And yes, I will see you this evening! sorry for any confusion my coverage might have caused Joe. Thanks for all the info and I’ll be much more sensitive to this in the future. I just went back and edited this story and removed the china mention. And don’t miss the bike on which the laptop with Aaron’s ideas is perched (4th photo from the bottom). That may have been the most unusual one at that meet, even if its cargo is mostly human. I hope a Freight Eight bike shows up! Where i’m from (isla vista), cargo bikes are for bums. and mexicans. for collecting cans. also other stuff people throw away. Sounds like your bums and “Mexicans” know how to have fun! Are you going to let them have all the fun, or just look down your nose at them because it’s “low-class”? Very satisfying to be able to make a big grocery store or Costco run without a car — good exercise too! Just goes to show how cutting edge those bums and Mexicans are. Being able to ‘do your business’ without a truck and a network of gas stations is going to be a good skill to have one of these days. Its phenomenal to see this revolution in Portland which hopefully will spread to every other American city. Commuting within our bike friendly community of PDX with groceries, pets and or kids in tow is good for so many things, health, the environment, your pocket book and just the plane exuberance of enjoying the great outdoors! May you all who show up tonight for the filming be the poster children and famous movie starts of this movement! Go by bike! Its phenomenal to see this revolution in Portland which hopefully will spread to every other American city. Commuting within our bike friendly community of PDX with groceries, pets and or kids in tow is good for so many things, health, the environment, your pocket book and just the plane exuberance of enjoying the great outdoors! May you all who show up tonight for the filming be the poster children and famous movie stars of this movement! Go by bike! Cognac Its phenomenal to see this revolution in Portland which hopefully will spread to every other American city. Commuting within our bike friendly community of PDX with groceries, pets and or kids in tow is good for so many things, health, the environment, your pocket book and just the plane exuberance of enjoying the great outdoors! May you all who show up tonight for the filming and be the poster children and famous movie stars of this movement! 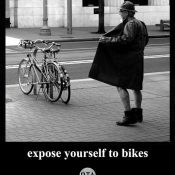 Go by bike! 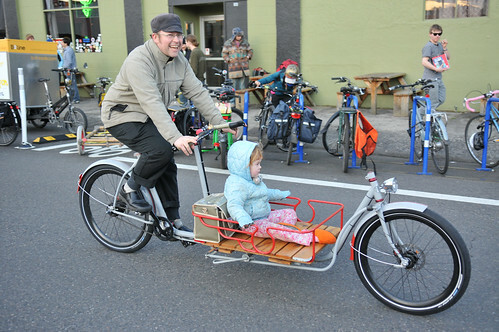 It would be great to see a side-by-side comparison of the various cargo bikes offered in Portland, including cargo capacity in volume and weight, cost, turning radius, 200 pound loaded stopping distance, etc… It is awesome to see so much innovation. Things have come a long way from when Worksman Cycles was the only US-made cargo bike in the business.